On his last visit to Toronto, Paul Simon invited an astonished woman on stage from the audience at Sound Academy, where the novice singer-guitarist performed her hero's Duncan with encouragement and help - "E minor," he reportedly whispered to her - from the man himself. This time around, the Simon of Simon and Garfunkel shared a larger stage with an established artist: Sting, the milkman's son whose birth certificate reads "Gordon Sumner" and who rise to fame as the leader of the tricky rock trio The Police. The results were just as charming (albeit more professional), and, at the end, there was little doubt as to the pecking order of the evening. The first song was Brand New Day; the last was Late in the Evening. Everything fit into place, smiles were in long supply and the practised Simon gracefully taught lessons in the art of performance. The name of the double-headed tour is On Stage Together, which pretty much nails it. On Sting's harmonica-pepped Brand New Day, the pair swapped vocals, with Simon, 71, handling the "you're the pupil, I'm the teacher" line while glancing at Sting, 62. Backed by an amalgamation of each other's highly capable bands - at times more than a dozen musicians (including three drummers) were doing their seriously professional thing - the headliners moved on to Simon's accordion-dappled Boy in the Bubble - "every generation throws a hero up the pop charts" - and Sting's Fields of Gold. After that, the frumpy, fedora-topped Simon commented on what he expected to gain from the collaboration, cracking wise about his hope to become "more Adonis" in physique and more durable in the sack. As for the self-satisfied Sting, he said he would "stay the same," thank you very much. With that, Simon split, leaving the stage for Sting's first of two solo sets. We heard Every Little Thing She Does is Magic, I Hung My Head, Driven To Tears, Walking on the Moon and Englishman in New York, in which the Newcastle-area native displayed his fascination with reggae and his maddening affectations, singing "English-mon" with a Jamaican flair that rivals the accent of our city's culturally eclectic mayor. The attraction of the show was the weaving of each other's material and the collaboration when the pair was on stage together. These two, of course, have much in common: They share a pan-cultural taste in boogies, and it was the rock critic Robert Christgau who once wrote about Sting: "Not since Paul Simon's dangling conversations has a pop hero made such a beeline for the middlebrow cliché." If he tried, Sting can't really touch Simon's literate word play. Moreover, on stage, his brash musicality showed as less subtle than did Simon's classic craft. On the other hand, Sting's ability on high harmony was, while not a surprise, a nice touch to this buoyant light-FM fandango. After Sting's mini-set, the pair reunited for A Mother and Child Reunion, which we shouldn't read much into. And if there are indeed 50 Ways to Leave to Your Lover, there are at least as many ways to leave the stage. Before Simon's 1975 solo hit, the two stars did need to discuss much. Sting simply shook Simon's hand and slipped out the stage left. A highlight of Simon's first solo set was his Africa-dancing hit Graceland, so spry after all these years. Other highlights included Sting's cover of Simon's America - he it prefaced with a story about the first North American tour by The Police that included a sparsely attended show at Toronto's Horseshoe Tavern ("Don't even [bleeping] pretend you were there") - and a duet version of Simon's The Boxer, in which the verse about "years rolling by" was oddly omitted. A four-song encore by the pair (which included The Police hit and stalker anthem Every Breath You Take, Simon's partying Late in the Evening and concluded with a cover of the Everly Brothers' When Will I Be Loved) began with Bridge Over Troubled Water. Solemn and gospelled, the duet made no one forget Art Garfunkel's soaring original vocals. The point of the song wasn't lost, though - empathy and the easing of the mind. 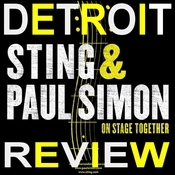 Offering a feel-good concert of good-to-great pop songs for our time, Sting and Simon disappointed no one and lifted many. 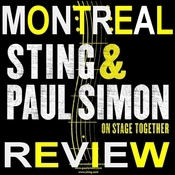 For more reviews from the Toronto show please visit http://www.sting.com/tour/date/id/2908 where you can view the setlist, leave your comments about the show, post images of your ticket stub and your photos from the show!